Add in the white sugar. And the brown sugar. 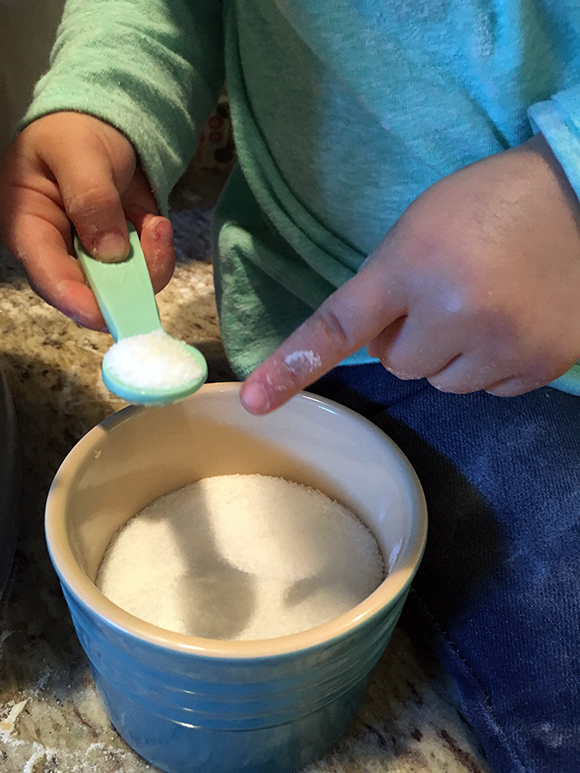 I like to dump the contents of the cup into the mixing bowl, but E prefers to slowly sprinkle it out using her finger (and then she recommends licking all the sugar off your finger once you’re done). 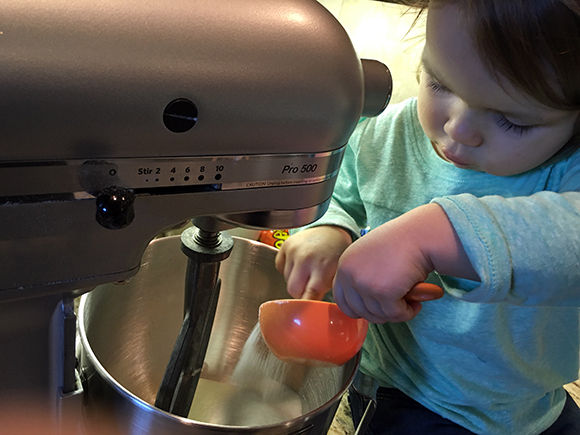 Turn on the mixer to medium speed. 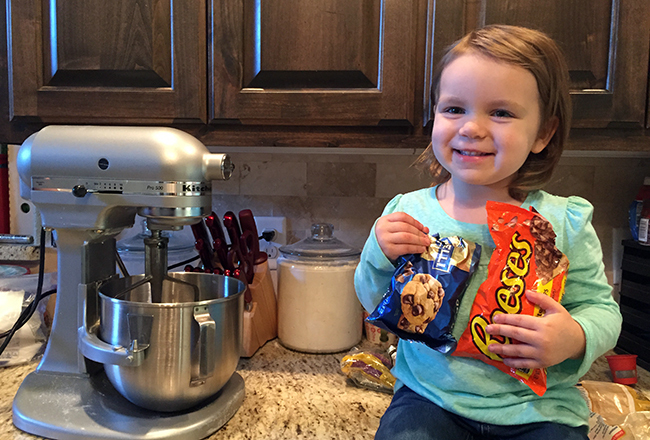 Mix everything until it’s smooth and fluffy. 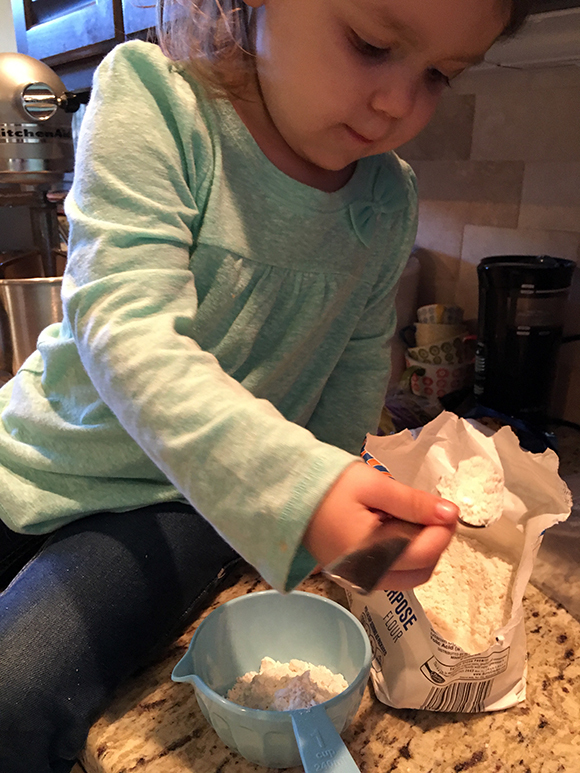 Add in the flour. I let E fill up the cups, which took a while, but it was a great project for her and she was really proud of her hard work. 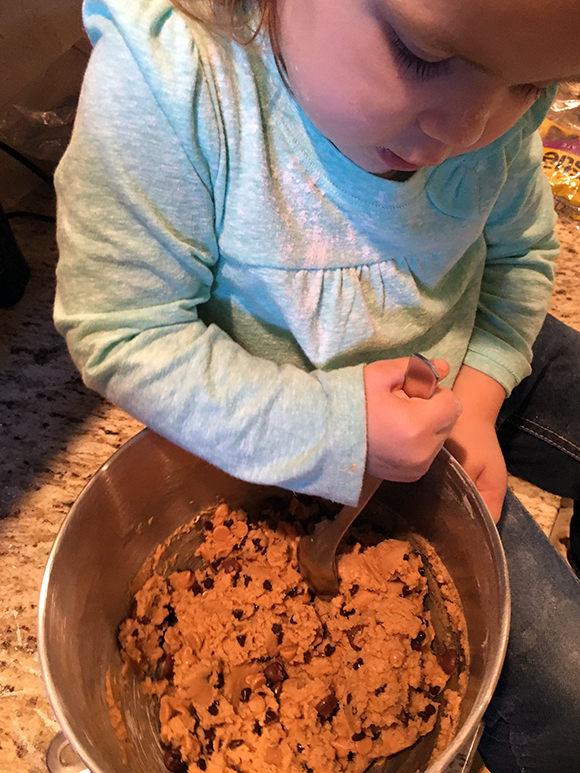 Baking with little ones takes longer but it’s so worth it, and they learn a lot along the way! Mix the flour in well. 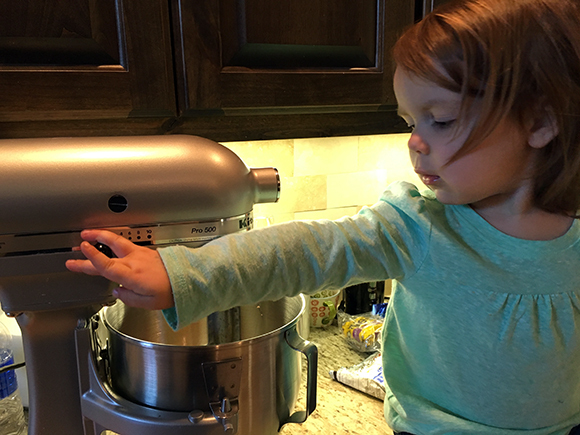 As a side note, you might want to watch as your child turns on the mixer so that he/she doesn’t turn it on high and sprinkle flour everywhere. Not that it happened to us, or anything. 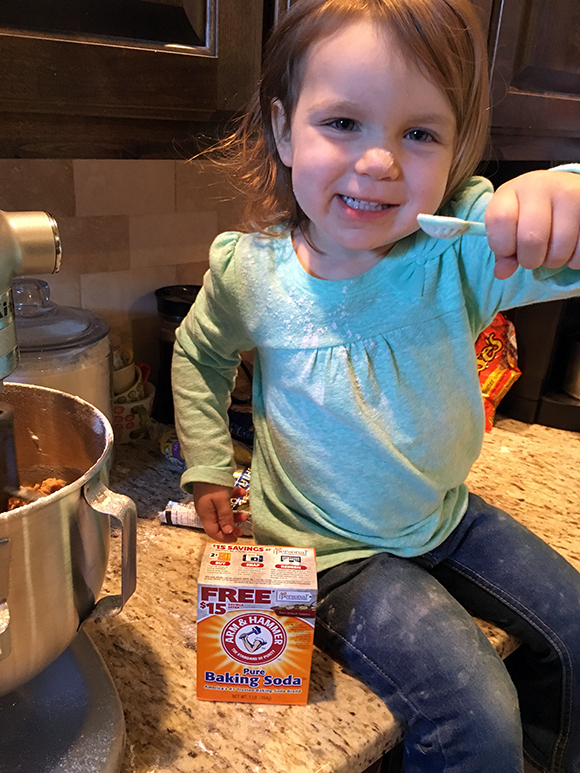 Next add in the baking soda (notice her newly floured outfit – it’s a baking fashion statement). 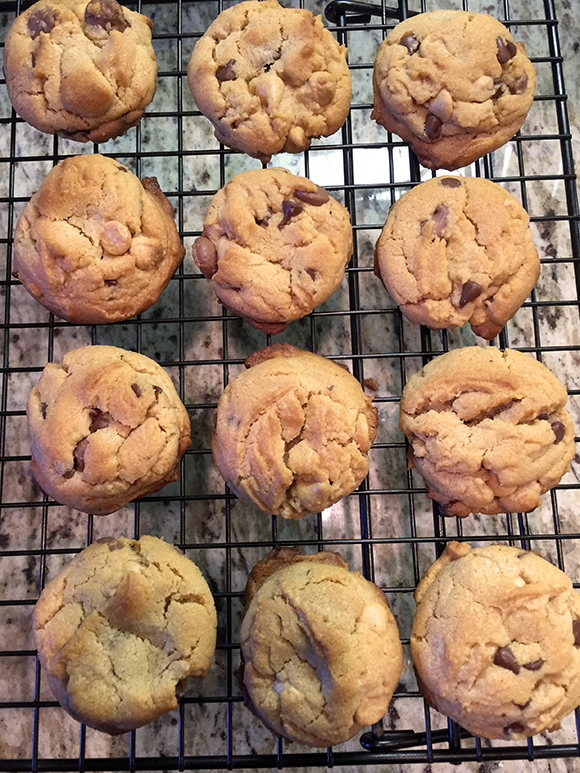 Then add in a half cup of each of the three kinds of chips: peanut butter chips, milk chocolate chips, and semi-sweet chips. 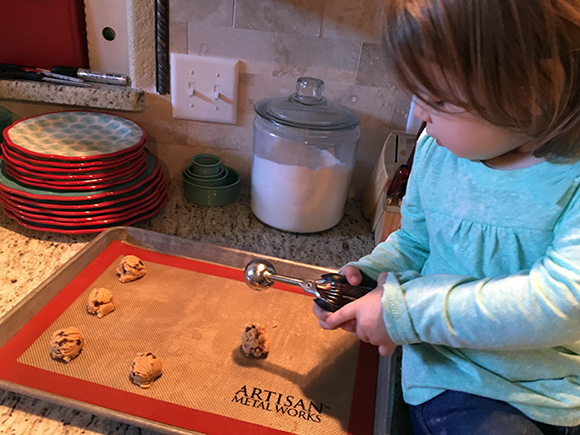 Be sure and taste some of each, to make sure they’re sufficient for use in the cookie. You might need to have several tastes to be sure. Stir the chips in well so they’re spread evenly through the dough. 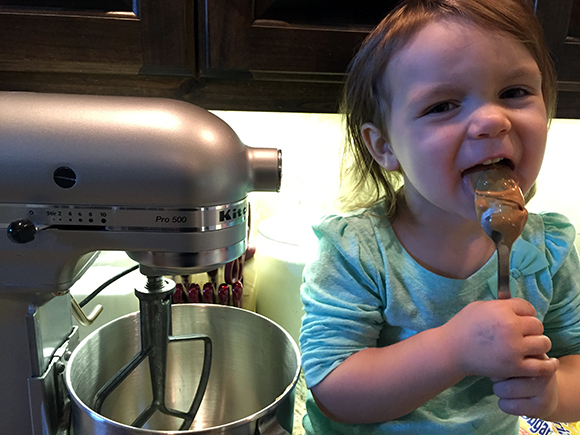 Then, get out your medium cookie dough scoop. If you don’t have one, get one. 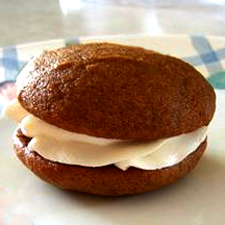 It will change your baking life. 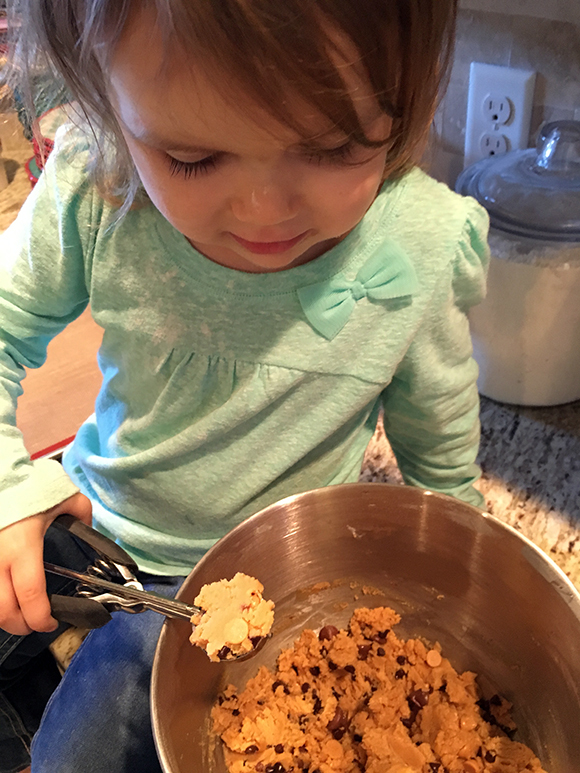 It makes it SO easy to have equal sizes of cookie dough balls, and kiddos think it’s a lot of fun to use. 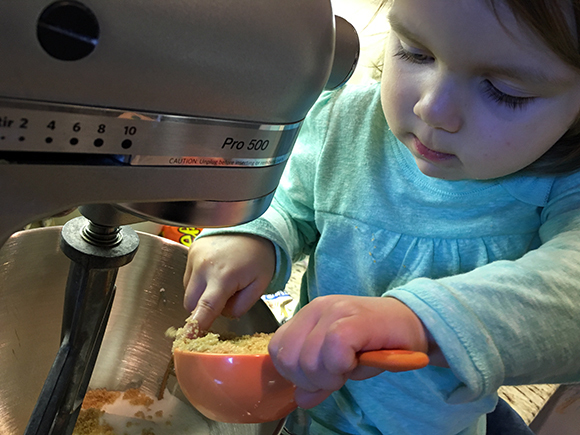 Just scoop up some dough (I helped with this part most of the time). Then place twelve balls of dough evenly on your cookie sheet. 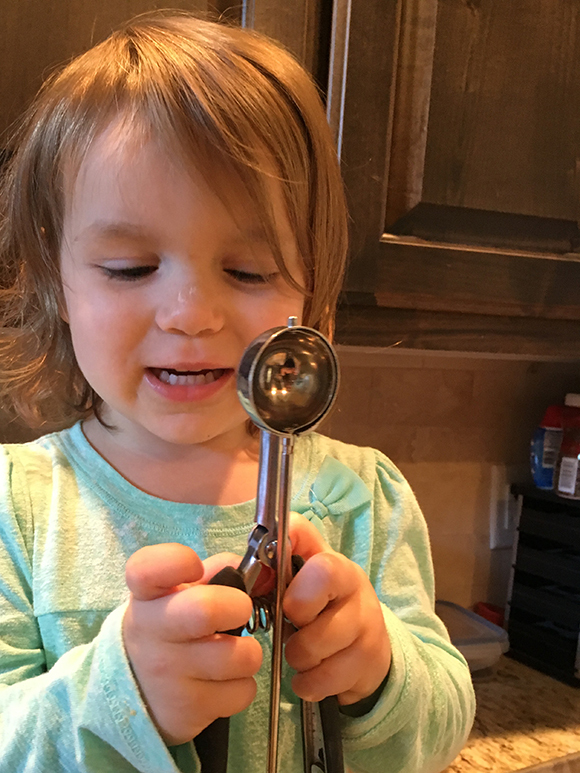 This part is easy for even little hands to do. 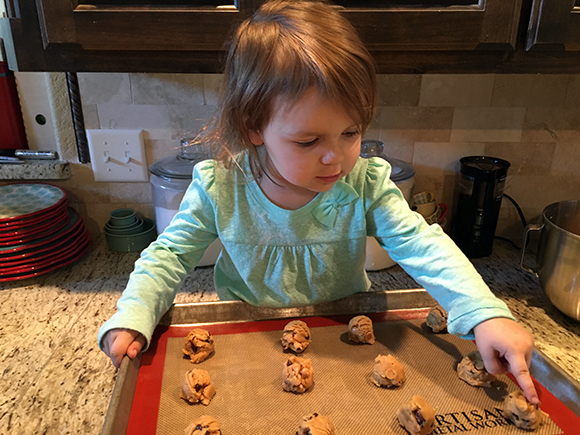 This is a great opportunity to let your kiddo do some counting – E decided to find out how many cookies we were putting on the cookie sheet. Turns out there were 12! Cool on a cookie rack for 10 minutes. Enjoy! 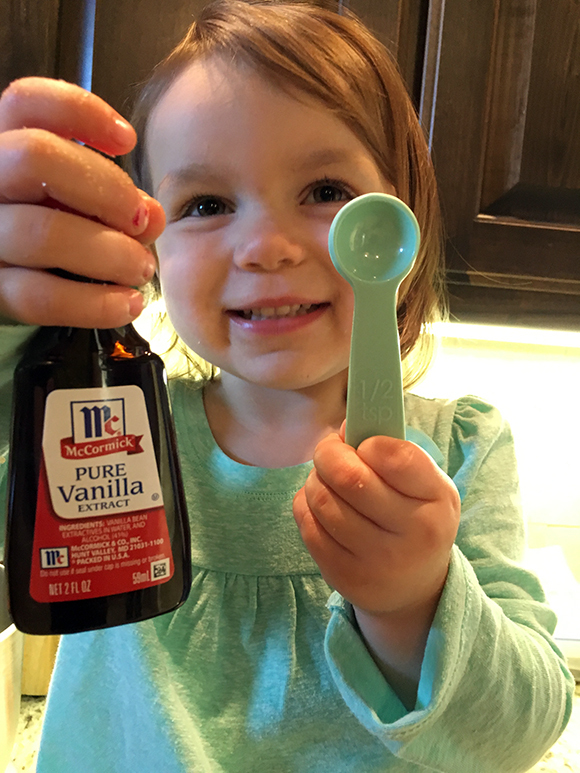 We would love it if you would share your Mini Chef posts with us each week, too! 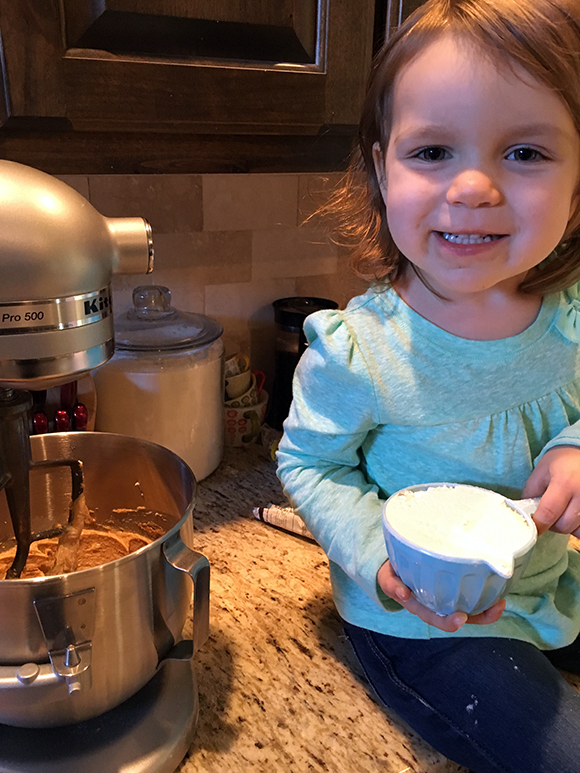 Follow along socially and join in on the fun by using our hashtag #MiniChefMondays to share creations your mini chef created in the kitchen. 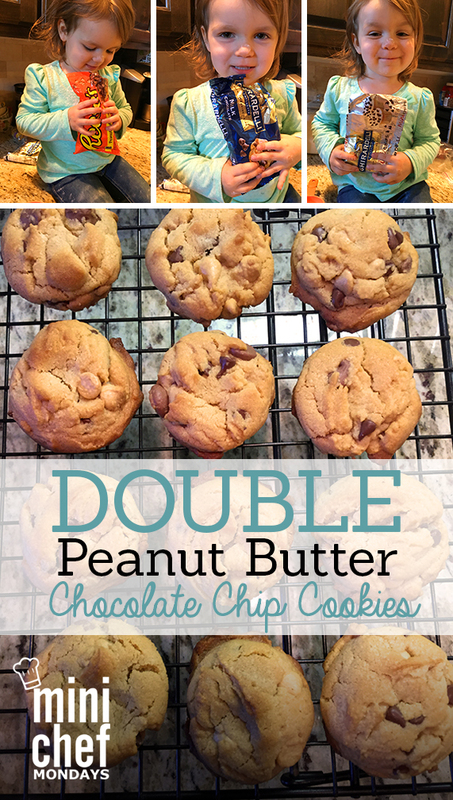 Additionally, if you have a kid-friendly recipe, link up! Don’t have a blog? Share the URL of your instagram photo in our linky below. Thanks! 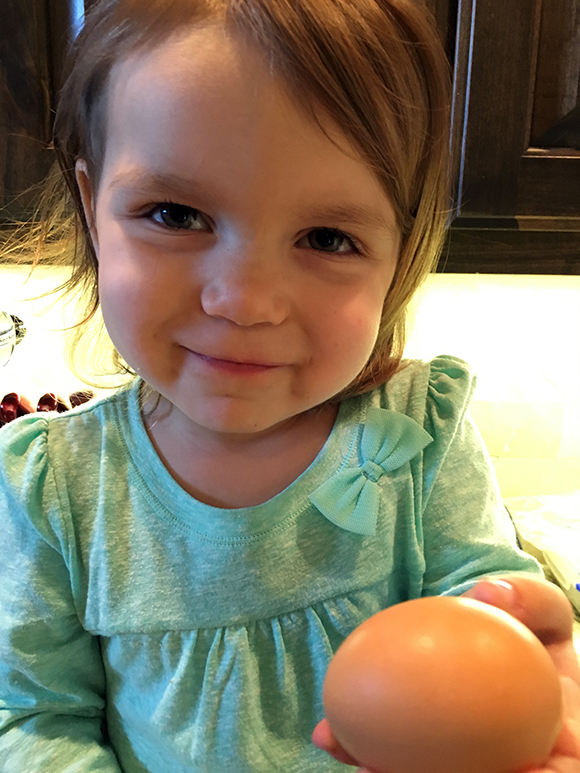 If you take any pics of you cooking with her let me know – would love to share in a post! It definitely takes longer when kids are involved but it’s so much fun! These look delicious.